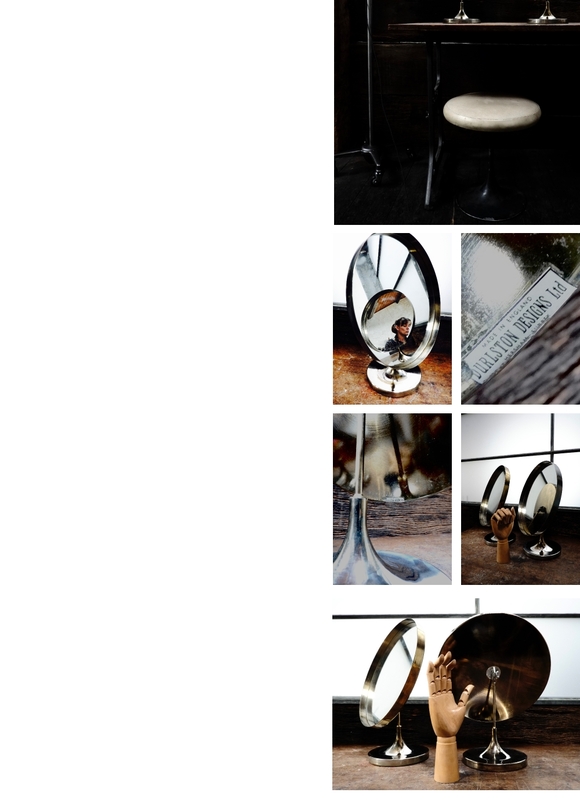 Durlston Designs 1960's table mirrors. Gold tone steel, attributed to Robert Welch. A matched pair of circular mirrors which are a great size for a dressing table or merchandising display featuring typical pared back 60's styling. ROBERT WELCH designed mirrors for DURLSTON DESIGNS (of Hersham, Surrey) from the mid 60's onwards with several different styles being attributed to him. The simple lines of these mirror bases are very reminiscent of LUMITRON table lamps, one of his best loved designs. The simple stem is attached with a single wing nut to the flange on the back of the mirror allowing it to pivot to any angle desired. Originally gold tone, the coating has worn and tarnished over time exposing glimpses of the base metal beneath. Both mirrors have their maker's transfers intact, one a little more scratched but both legible.The generously proportioned circular mirrors set within simple metal bands are in good condition with a little wear and foxing around the edges. Here is a fascinating interview by our friends at the marvellous, Mid Century Magazine, with Robert Welch's children Alice & Rupert which gives great insight into his working method and sources of inspiration.